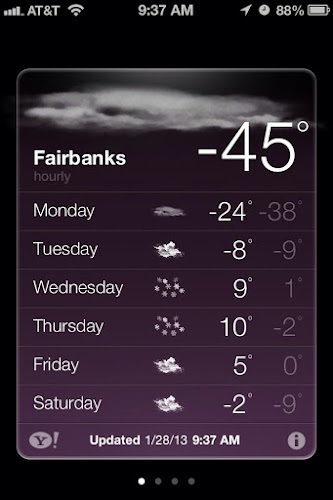 According to the National Weather Service, this how they describe interior Alaska. It is almost sunrise this morning when I walked out to get some coffee around 10am. The ice fog is has been pretty bad for the last couple of days and being anywhere in town has been unhealthy according to the EPA. 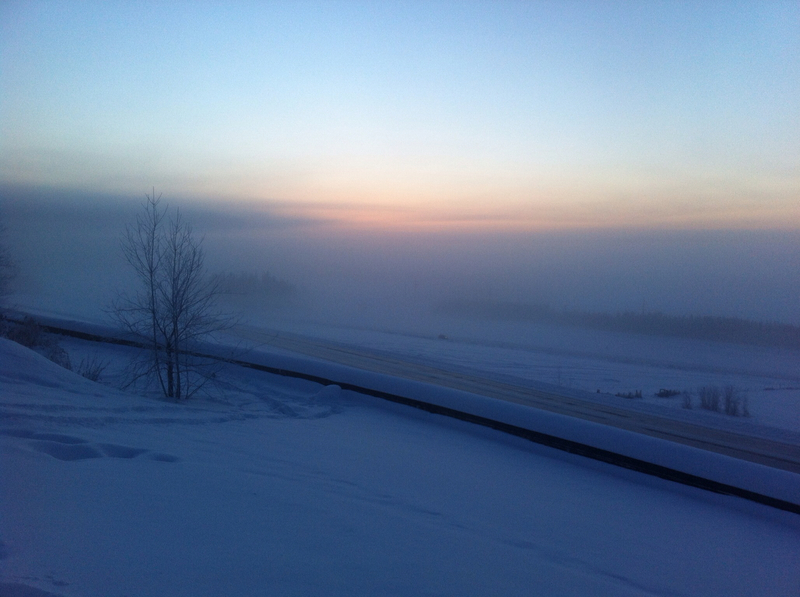 The university is only a little above the valley floor but it is sufficient to get above the ice fog. According to the SMS messages from the police, there have been multiple accidents due to the low visibility. The temperature is still pretty cold but we are fortunate that there is no wind to make it feel even colder. I have still been able to get out for some short walks. I've been trying out another iPhone app that uses the accelerometer and GPS in a way that tracks your movement without rapidly draining the battery. It seems to be working pretty well and my battery has been lasting most of the day. According to the app, I'm still managing 10k steps per day. I was thinking of trying out the FitBit activity tracker but this seems to work. Now if there was someway to upload the data. I didn't get out to the garage and do anything with the bike due to the cold weather. The garage door was accidentally left open yesterday for about 15 minutes and that was sufficient to shut down the garage heater. I needed to warm it up a bit using a very old, forced air, kerosene heater. But it does put out a lot of heat (and a lot of fumes) and had the interior heated up to about 50°F in about 30 minutes. Eventually, the water from the boiler started running again and the blower kicked back on. It is barely able to keep up at these temperatures. 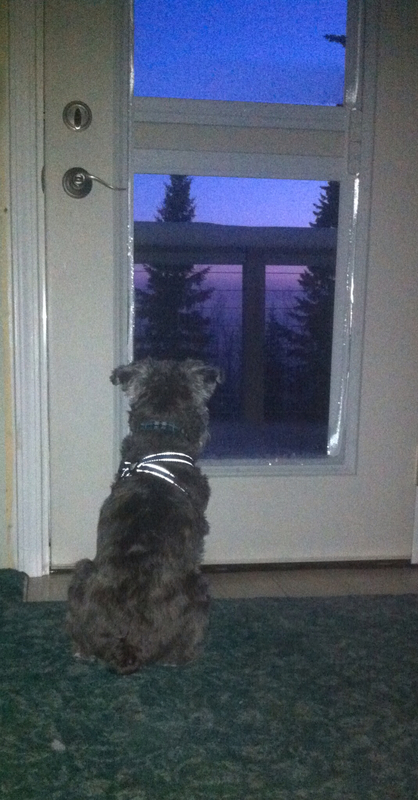 The dog seems to be watching the sunset last night or else looking for moose. Initially, the cat was sitting there as well staring out the window but as soon as I took out my phone to take a photo, the cat lost interest. There is evidence that a couple of moose have been bedding down in the side yard next to the dog run. A short update on the ChromeBook. I'm still using it almost exclusively. As you may notice, I started this post on the iPad using Blogsy as it's the easiest way to get pictures taken with my iPhone into a blog post. They nout sync with iCloud and within minutes after taking a picture on the phone, it is available on the iPad or just about any other Apple device. I haven't figured out a good way to access the pictures on the ChromeBook. The only other time I had to break out the laptop was to edit a locked MS Word document. Google Apps could read the document but I couldn't enter text into the fields. For what they were trying to do, a PDF form would be a better choice. The new tire levers came in from Amazon today. With these, I shouldn't have a problem with enough leverage. They are made by a company called Ken-Tool. I included the pen in the photo as a size comparison. 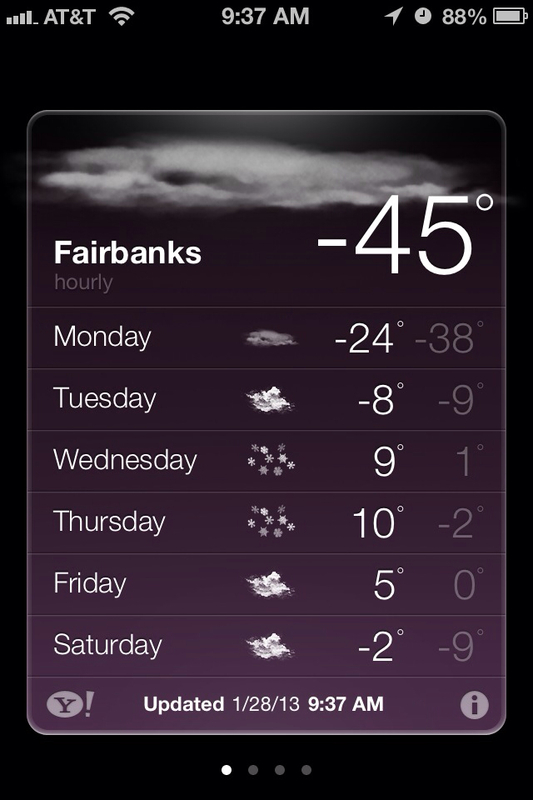 Ok, I'll never say I'm cold again...-45° What do people use for antifreeze up there? or has everyone plugged in their block, oil and battery heaters all the time? The tire irons look sturdy enough and from what I hear, I'll have plenty of opportunities to change the tires on the new rig. We don't have any wind or humidity so it doesn't feel as cold as some other areas. Yes, silicone heat pads on the oil pan, battery blankets and block heaters on all vehicles. And generally plugged in all the time when it's below 0°F. The parking lots have outlets for every space and if it's above 0°F and below 20°F, the power is cycled. Standard anti-freeze mixed 60$ anti-freeze to 40% water. The pre-mix stuff is too dilute to adequately protect your engine if it gets much colder than this. Your dog looks like he really wants to go out in the snow but he knows his parts will freeze off. best to hold it. They go out all the time and don't seem to have much problem with the cold and always want to go back out after coming in. Icy fog. Sheesh. I can see how that could cause problems if it is thick. I know you don't have any wind, and that helps with the temps, but would it help to clear out the fog? Those tire irons are beefy! Ice fog is bad on multiple fronts. The worst part is it is made if frozen water surrounding a particle of something usually ash or soot. You breathe this in and the soot is left in your lungs. The wind really help clear out the ice fog and it stirs up the air eliminating the temperature inversion that inevitably comes with very cold temperatures. "The silliest thing I've ever seen"